Full stats for 4A-15 can be found on the 4A-15 Stats Page! Overview – By no stretch of the imagination are the teams in this district necessarily causing panic across Class 4A, as only one of the four even finished the 2013 regular season with a record above .500. But the fact is that all four of these clubs finished right around .500, which sets the district playoffs off as an open playing ground that any of the four are capable of taking. LaSalle returns as the top seed still in search of its first title in this new district, which may be its last chance depending on the direction of next year’s district realignment. Defending 4A-15 champs Doral Academy come in as the second seed, which is right where they started their run last season as well. The plotlines run deep in 4A-15, with a mixture of some of the youngest and oldest schools in the area. It’s anyone’s guess which will one will add a new trophy to its case. Mike Matheis could see some big innings for the Lions. 1. LaSalle – For the second season in a row, the Lions enter the district tournament as the top seed. Should LaSalle take care of business against Ransom, a team it has already beaten twice this year, then it would be back in the regional playoffs and district championship with a chance at redemption. The 55-year old school has enjoyed a lot of accomplishments over the years, but has yet to celebrate a baseball state title. That sort of a party would likely begin with a district trophy. Should the Firebirds also advance as the higher seed and favored team, it would pit LaSalle against them in a rubber match for all the marbles after the two squads split their regular-season meetings. These two have a habit of playing close, low-scoring games, and there is little reason to expect otherwise should the expected rematch take place. Right-handers Sergio Miyares and Mike Mathies provided the team with enough pitching depth to win two games in a short time span, a factor which just could prove to be the difference. Offensively the team has a duo that is tough to pitch around in Nick Canino and Elier Rodriguez. Rodriguez has hit around .500 all season and Canino has provided the most power in leading the club in extra-base hits. Getting to the regional playoffs is not a new accomplishment for LaSalle, but that does not mean that it is something that is not a great achievement in and of itself. But for this talented team it is merely the starting point to a road that hopefully leads all the way to Fort Myers. Alexis Valladares and the Wolves will be looking to make history this postseason. 2. TERRA – The Wolves doubled their win total from a season ago, and earned the home position in the 4A-15 semifinal after posting a 4-2 district mark this year. This young program is in only its fourth year of existence, which makes every new accomplishment a ground-breaking new experience. Should it manage a victory over the Firebirds and advance to the district title game, the team would earn its first berth in the regional playoffs. The Wolves would also avenge a 9-0 loss to Doral that ended their season, after falling in the same game as the number three seed last year. The Wolves won three of their final four games to come into the district playoffs on a positive note. Leading the way for the team is junior Alex Saavedra, who led the squad with 25 hits, seven doubles and 29 RBIs. Sophomore Yasser Santana has specialized at getting on base and scoring runs for the team, of which he has 20 on the year. Rueben Pino has also been a reliable offensive weapon for the squad. Sophomore Alexis Valladares has been the workhorse in leading the team in innings pitched, while Tyler Pritchard has emerged as a reliable force on the mound. 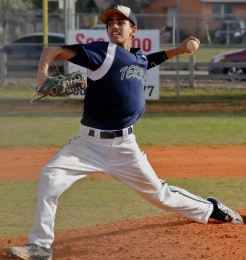 Freshman Andres Perez has struggled with consistency, but has pitched well enough to lead the squad with a 4-2 record. Young teams typically have to take their lumps for a while as they learn the ropes. But the Wolves just may have the team that is ready to take the program to the next level. Andy Hernandez and the Firebirds are looking to defend their district 4A-15 title. 3. Doral Academy – The Firebirds know how to win when it matters most, which it proved in winning a tough 2-1 victory over LaSalle for the district crown last year. To get back in that same position this year, Doral must first get past a young and talented TERRA team that beat them twice already this year. But the Firebirds know winning in the playoffs is a whole other thing. Heading the group returning for their 4A-15 title defense is junior shortstop Alejandro Juvier, who leads the squad in hits and runs scored. 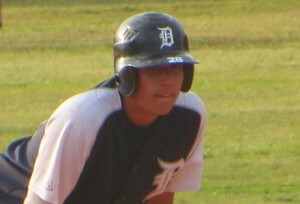 Junior catcher Christian Hernandez clubbed 10 doubles and two home runs this season, and led the team with 21 RBIs. The Doral starters struggled in allowing a few too many runs, but overall the group has put up solid numbers throughout the 2013 campaign. Senior right-hander Alexis Davila has led the way, posting a 3-4 mark to go with an ERA just over 2.00 while also leading Doral in strikeouts. Fellow senior righty Andy Navarette has handled the bulk of the remaining workload on the mound, going 5-3 on the year. Pitching most often trumps hitting, and the combination of these two pitches may be enough to help carry Doral back through another long postseason run. 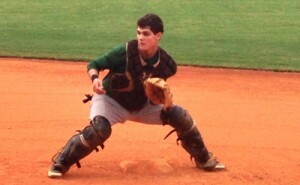 Ransom sophomore catcher David Lanster has been the offensive leader on the ballclub. 4. Ransom Everglades – The Raiders have improved upon last year’s mark, and were playing right around .500 before a rough five-game losing streak to end the regular season. Ransom has not fared well against LaSalle, falling twice by a combined score of 17-5 this year while having yet to beat the Lions since the two joined the same district last year. The team has its best chance if it can replicate the things that it did well in their first meeting this year, when they fell 6-5 in a close contest. The Raiders have been led all season by sophomore David Lanster, who has hit .421 while leading the team in virtually every batting category. Caleb Bush and Mathew Heisenbottle have also been consistent contributors in the lineup. Royevan Armas heads a pitching staff that has been the strength of the club, appearing in more than half of the team’s games this year. 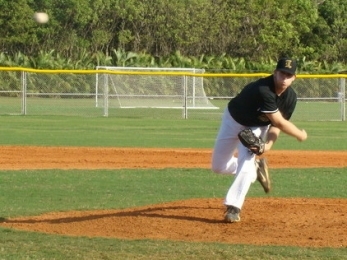 Armas led the team in strikeouts with 40, averaging about one per inning. Ryan Moralejo was also a workhorse throughout the year for the Raiders, while Chris Rossi led the club with a 3-1 record. Ransom Everglades celebrates its 110th year in existence this year, and in all that time the school has yet to ever win a state championship. For now, the team has its sights set for the district trophy.